Tall Girl In Heels : AHHH...Riveting! 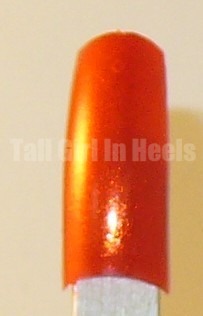 Riveting is a gorgeous burnt orange color from China Glaze. Riveting is from China Glaze's The Hunger Games Collection. When I first saw this color I knew it needed to be added to my lemming list. Love it. Riveting applied like WOW! It gave me no problems and the formula was great. It sparkles and shimmers and make we fall in love every time I look down at my nails. Pictures don't do this color justice. It is A-MAZE-ING!! Amazing!! I have nothing bad to say about this polish. I also love Luxe and Lush. This picture shows Luxe and Lush on top of Riveting. It looks like golden goodness when layered with Riveting. I love this combination!!! Please comment with your ideas, thoughts and anything else you want to share. I love orange. I may have ro get this.